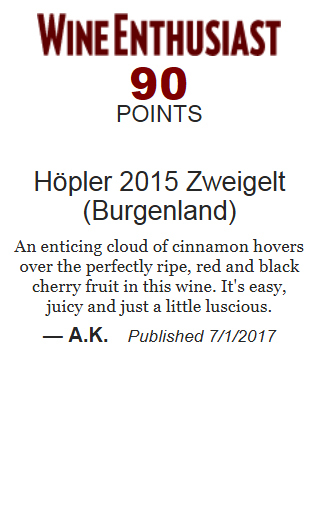 We are proud to announce that our Höpler 2015 Zweigelt has been awarded 90 points by Wine Enthusiast Magazine. Zweigelt is a fantastic summer red and possibly the ultimate bbq wine. It has a juicy softness that balances chargrilled foods and compliments a spicy bbq sauce. It has an elegance that never overpowers a salad and a brightness that encourages you to fill the next glass! Zweigelt allows you to bring something new along to a bbq. Its violet tinges make it distintive. Challenge people to guess what it is, its name will get people chatting and once tasted they will realize how much they love it!